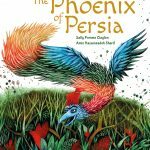 A new publisher is bringing Iranian children’s books to the UK market, with the first two titles out in January. 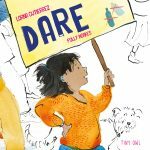 She is aiming to publish eight children’s titles next year starting with two in January: The Little Black Fish by Samad Behrangi and A Bird Like Himself by Anahita Teymorian. 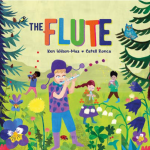 The Little Black Fish, first published in 1968, is about a fish who, unlike his friends, dares to venture out of the pond into the stream, then the river, then the sea. 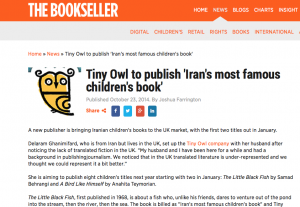 The book is billed as “Iran’s most famous children’s book” and Tiny Owl is the first company to publish it in English with the original illustrations, said Ghanimifard. A Bird Like Himself is a about a chick whose mother isn’t there so is cared for by a variety of foster parents from the animal kindgdom. Ghanimifard hopes the books portray a side to Iranian culture that is not known about in the UK. “I think it’s good to talk about diversity and know about diverse cultures and the way people live… Iran is different from how it is portrayed in the media, you never seen anything about the culture or people,” she said. Both books will be published in paperback, with an r.r.p. of £11.99 for A Bird Like Himself and £12.99 for The Little Black Fish. Sales representation is by Salt Way and distribution by Orca Book Services. 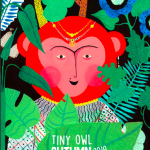 Tiny Owl: The two titles are in hardback.